Sakura smiled as she took his hand glad that her Uncle wasn't going to push fighting her on this one. Although she wasn't aware that Toushirou Hitsugaya never gave up on anything easily. Toushirou looked at her then narrowed his eyes a moment at there holding hands. "Not yet." he agreed in a cool tone one that Ryo would know from years of dealing with him meant that everytime he was with Sakura Toushirou would be keeping tabs on him. Yuki watched her a faint blush staining his cheeks as she stuck her tongue out like that before Rangiku moaned. But he didn't have any time to be disappointed or come down off of it. As she began using her hand. His breathing began to deepen out as his head tipped back eyes closed. Sakura had this uncanny feeling that she had missed something. She looked at him and shook her head as she regarded both her boyfriend and her Uncle. Yeah she had missed something alright. Toushirou rose an eyebrow. "Again?" He said as he shook his head he didn't even try to figure out Benishihone but Yuki? He had to wonder honestly how he kept up with such a flirtous girl. Yuki looked at her, as Rangiku seemed to enjoy herself playing with Benishihone then offered herself up to him. He had a moment to wonder how the heck he had gotten himself into this sitution before giving in to desire and want which he was certain was excatly what these too wanted anyways. He moved and entered Rangiku looked down at her as he took a deep breath after settling a moment he pulled back. "You should have warned her Benishihone." Yuki finnally spoke. For a man who's Reiatsu was that of the most frigid ice. And handled everything with such a cold demeanor.....when it came to this....he was not easily satitsifed. Then began moving setting a rythm that would have her Moaning for him. Toushirou sighed and looked at him. "Why are you asking me?" He said notcing that Sakura seemed to be relaxed at the moment and appeared to be dozing off. Now that all danger was completely passed and they were safe. So far and he would knock on would make prayers to where he had to and keep a safe distance on almost every occasion up to and including freezing her to keep Benishihone from being able to get him in that way. He refused to be added on to her list of conquests of course he had no idea that she nearly got her hands on Sakura. Sakura rested with her head against Ryo's shoulder. She had gotten away from being seduced by Benishihone only because Zakurakadoguchi and Shiori got in the middle of it. Shiori not wanting to be used by anyone heck she often gave Sakura greif and they usually worked with each other. Yuki kept his movements up and moaned when Rangiku began to play even more if he didn't know better he'd swear she was taking lessons from Beni. He continued to move caught up in the moment. Toushirou sighed and walked over sitting down in a chair and shaking his head. "Not good I have my men stationed everywhere but he's covering up his tracks well. After that last attack on earth when he dissappeared back to Hueco Mundo it's left us all in a disarray. The twelveth division is attempting to get Captain Yamamoto to sign off on there testing Kurosaki in order to see if his power can be replicated in a mod soul." Toushirou sighed as he shook his head. "Ukitake, Myself and a few others have vitoed that but Kurotsuchi is still pushing for it. He's dying to experiment with the boy. At the moment it's Kurosaki that Aizen is having a hard time getting around in the living world, Kurosaki and his friends are keeping Aizen from being able to gain any ground, so removing him will be a problem." he sighed shaking his head. "Another problem is that with the new Espada appearing it's becoming apparent that Aizen has full control over the Hyouguku and unfortunately it's creator is unable to figure out how to reseal it and keep it from being used to create even more." Toushirou sighed. "More over we have reports that....Espada number one is a pure. Aizen didn't create him with the stone he was naturally born in Hueco Mundo and is perhaps more dangerous because of it. Kurostuchi has a theory that if the stone is resealed the Arrancar will loose power....Espada Number one..won't." Yuki groaned when she rejoined them in such a way before he began moving for her. He did however watch what was going on with Rangiku and Beni shaking his head as he moaned trying to keep focused on what was going on so that he didn't hurt either one but it was getting harder to think past the raw passion. Ryo growled deeply and said... "Why havent we already taken the fight to Hueco Mundo with all of us fighting plus the new shinigami that show up everyday we should be able to do it...." He looked at Toushirou and then said... "If only Yamamoto would have just listened to me when this whole thing started and kept tabs on every single captain we could have avoided this now we have to take them out...."
Toushirou sighed. "We have. 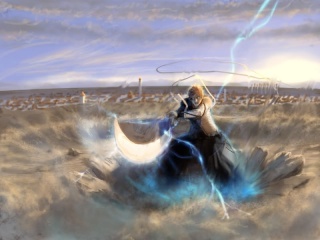 Kurosaki a month and a half ago lead a group into Hueco Mundo and fought off most of the Arrancar and Espada." He said shaking his head. "Aizen just dissappeared and has begun to rebuild his forces. We don't have enough intel on the depths of Hueco Mundo to be able to launch an effective attack just yet." He said as he looked at him. Then nodded. "I know. This could have been prevented." He said shaking his head as he took a deep breath. After all he had listened and done his own research. In the end he alone had not been enough. Yuki groaned but moved no longer soft movements but hard enough to bounce Benishihone up and down without him doing anything more then moving his hips his hands coming up and slide along Rangiku's slender hips before cupping her breast the other going to Beni's free as he began to play with them. Toushirou took a deep breath and looked at him. "Ragnarok..." He said as he looked at Ryo. "That blade is capable of tearing apart Soul Society the living world and Hueco Mundo. The problem remains if we destory Hueco Mundo to get rid of Aizen the hollow that are born will overwhelm the living world and those souls will be lost." He sighed as he sat back. "The only other alternitave would be the mortal blade Excaliber. But..." Toushirou shook his head. "None in Soul Society can weild such a blade. It would take someone from the living world that would be able to see Aizen." Yuki didn't stop but did moan when Rangiku cried out like that he continued on not sure how he got into this situation but it was a little late to protest now. He was caught up in it and on some level did enjoy it although at the moment even as he found his release he didn't stop he wasn't the sort to be satisfied so quickly. Toushirou took a deep breath. "I know." He said looking at Sakura. Excaliber was not a sword that could be taken lightly and would make a world of difference but Ragnarok was a world destorier. Both swords where incredibly powerful. And if used wrong could bring about the distruction of everything. Ichigo was wild and unstable on a good day. Sakura...seemed to have the same unstable reiatsu but also more centered mentally. "I know they were two of our options but we need to figure out if there is any other way before pulling out those cards." Yuki groaned as the girls switched places then began moving again. Caught up in the thrill of the moment he wasn't about to start complaining. Toushirou took a deep breath and shook his head. "I don't know." he said as he looked at him. And he didn't. He knew they were just about out of time and out of options. But at the same token using either one of those seemed just as reckless. But if the war broke out it was all over. He took a deep breath as he sat there. "I don't know." And for Toushirou to admit that things were dire indeed. Yuki groaned as Rangiku did that, his head tipping low as he moved caught up in the moment as he continued to thrust. His head bowed of course it didn't help that Beni knew how to bring out the 'worst' in him. Toushirou sighed and nodded looking at Sakura a moment as she slept resting against Ryo. "Ichigo's Reiatsu is far to unstable to be able to handle Excaliber. Sakura..." He said pausing then closing his eyes he had to put aside his personal feelings. She was a Substitute Shinigami, a fighter and a....Hitsugaya. Ryo was worried about something he knew that but the Hitsugaya clan,where the ones who were consindered guardian of the heaven's and Sakura was the first of there clan to be born in the living world. "Then we had better get the clearance to unseal Exicaliber and get it to Sakura between the two swords I'd rather try Excaliber before bringing out the dooms day sword." He said shaking his head. Yuki groaned as he moved feeling the tension building as he was nearing his second release. Normally he could go much much longer then this, but this was the second time today and not that long ago to boot. He took a deep breath as the heat built up in his stomach, as things tightened even more in lower regions before he felt his release catching Rangiku's hips as he bowed his head jerking with the sudden release of tension and passion. He braced himself while he relearned to breath catching his breath. It wasn't that he was getting old, just the opposite fighting a battle after going round for round with Beni to have another go plus Rangiku....things were certain interesting. Yuki pulled away after a few moments sitting back on the floor since he was in no mood to sit in his chair and have to clean it before he could get any work done. "Your incouragable Beni." He said in a low husky tone. Then glanced at Rangiku and shook his head sighing. There was certainly never a dull moment with them around. The two girls curled up beside Yuki and cuddled with him all of them at their limit.... "Thank you...." Benishihone said to him after he spoke..... She could feel the tension level increase wherever Ryo was so shje said... "Huh it seems that Ryo is getting angry...."
Toushirou took a deep breath as he looked at him. It was true Ichigo seemed to be a natural swordsman and quiet powerful and Sakura didn't seem to be that strong in it. But..."Training can make up for that." he said in a light tone but it also indicated he wasn't thrilled about teaching her or having to be rough with her for the sake of swordsmanships training. Sakura had been awake for a little bit before sighing and speaking to the two men who seemed to be discussing things about her or rather about the war going on and it concerned her. "I can sword fight." She said softly to interupt them. "I am an Ten-ken user." she said sitting up and looking at them. 'Gods sword.' Unparralled sword skills. Yuki sighed as he held both girls against him and glanced off into the building before shaking his head feeling the slight rise in the others Reiatsu. "It does...something must be upseting him." Sakura looked at him, Seemed she had managed to upset him with this whole subject but that was not her intention. "I know Ichigo he's in school with me." She said shrugging lightly trying to defuse his anger. "I know it's a tough bill and I know there are risks involved. But if your willing to train me to work with me I'm more then willing to try." She looked at them both. "But If I can't even after training I will accept that. But at the very least I can say that I tried." Toushirou looked at him and shook his head no. "No offense taken." He said in a light tone. And none was, Excaliber was not an easy sword to weild by any stretch of the imagination. "It will not be easy and the training may very well end up killing you." He said in a calm tone. "Understand this my Hyourinmaru's power is limitless, so long as there is water even in the air he will be reborn time and time again. Ryo's own Benishihone is without bounds, so long as there is air to burn she will continue to burn." Sakura listened to him and nodded. "Zakaurakadoguchi is the Cherry way Uncle Toushirou, she is the frozen dragon who guards the gates of death." Sakura spoke softly. "So long as the cycle continues so will she. I know I have not fully mastered her power yet, but I am thankful that she has choosen me as her Shinigami. I will train to protect the world and keep the balance. But I'm not so foolish as to not accept if it is something beyond my reach." She looked over at Ryo. "I know my limits and the only way to find out if I can push beyond them is to try. All I can do is ask for your help in this matter." Yuki looked at her and nodded. "Ryo does have a rather firey temper, and once it gets going not much can calm him down." He said as he rested there holding both girls to him. "But...I do not think this is the same as fighting I think he's upset about something else. Last I knew he was with Toushirou and Sakura. And as far as I knew he was fond of them both." Yuki meant that Toushirou seemed to be viewed as a kid brother to Ryo as far as he could tell and Sakura meant something much more to him. Sakura watched him go and took a deep breath. He looked so very angry. "He's mad at me." Toushirou sighed and looked at her nodding a moment then standing. "Come on, you'll be staying in Squad 10 Barracks." he said as he stood and she followed suit. Ryo needed time to cool off that firey temper of his. And Sakura needed time to fully realize what it was she was getting herself into. He began walking with Sakura out of the Shinseina's headquarters to take her back to his squad trusting that Rangiku would catch up. Having no doubt she had been having fun here. He had been fully aware of his Leuitant's arrival. Yuki nodded to Rangiku. "I'll talk to you later." He said to Rangiku before returning the firey kiss that Beni gave him watching as she faded from the room to return to Ryo. He took a deep breath. Having a feeling things were going to be getting tense around here soon.